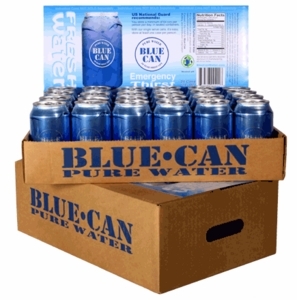 Packed in food grade safe aluminum cans that do not deteriorate or rust, Bluecan purified drinking water is safe to store long term and safe to drink when other water supply sources are unavailable due to a disaster or other emergency. Where does Bluecan water come from? The Blue Can canned drinking water is packed under strict food processing standards and regulations in a fully licensed and permitted facility in the USA. The facility is equipped with a dedicated canning line (also called bottling line) line which processes only drinking water and no other products. How does Bluecan water stay fresh for 50 years? The secret lies in the method of processing and filtering the water prior to canning it. The water undergoes a multi stage filtration process to ensure that all bacteria and CFU's (Colony Forming Units) are eliminated from the water. The water is 'biologically dead'. By packing the water under elimination of air (which contains bacteria) and in aluminum cans that do not allow sunlight to penetrate, bacteria that could spoil the water can no longer form inside. Who should buy and stock this product? This canned water comes packed in convenient 12 oz soda style drinking cans which makes them ideal for anyone to use. The pop-top opening does not require a can opener to access the water and the familiar 12 oz size is the same as most soft drink manufacturers use for their products. Where can I buy Blue Can 50 year shelf life drinking water? You can purchase this canned water directly from us. We are offering bluecan in many variations from a convenient 6-pack and single cases with 24 cans, to entire pallets with 100 cases and even truck loads for large volume requirements. We also offer package deals with various case quantities that are available for pickup at our warehouse location in Whittier, California or can be shipped directly to your door. For more information and to order your supply of Blue Can safe 50 year shelf life canned drinking water click on the image below to be taken to our detailed product page.